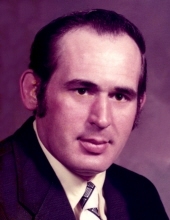 John J. Gey, 78, of Reese, died Wednesday afternoon, March 27, 2019 at Wellspring Lutheran Services in Frankenmuth. He was born January 18, 1941 in Saginaw, son of the late Roland C. “Red” and Dorothy (Engelhart) Gey. John was a 1959 graduate of Reese High School and served his country with the U.S. Army. On September 14, 1974 he married the former Barbara Spiess in Saginaw. She survives him. He was employed for thirty-one and a half years as a Line worker at Saginaw Steering Gear. retiring in 1999. John also farmed in Denmark Township most of his life. He was a member of UAW Local 699 in Saginaw. Surviving besides his wife Barbara, are his two children; Bryan Gey and Carol Ann Gey both of Reese; and his uncle and aunt, Irving and Janet Engelhart of Bridgeport. Visitation for John will take place from 1-5 p.m. Thursday, April 4, 2019 at the Ware-Smith-Woolever Funeral Home, 9940 Saginaw Street in Reese with cremation to follow. There are no funeral services scheduled. Those planning an expression of sympathy are asked to consider St. Jude Children’s Research Hospital or The Shriner’s Hospital. To plant a tree in memory of John J. Gey, please visit our Tribute Store. "Email Address" would like to share the life celebration of John J. Gey. Click on the "link" to go to share a favorite memory or leave a condolence message for the family.